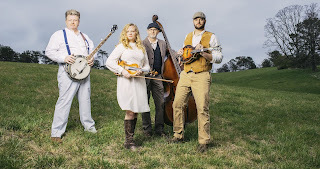 Background - Kentucky Bluegrass band NewTown is bringing new life to the “Old World” with their new single “Naomi Wise,” an old English murder ballad written in modern times. It tells the story of commoner Naomi Wise who falls in love with a man in high-standing and what happens when forbidden love takes a dark turn. Written by Donna Hughes, the haunting “Naomi Wise” serves as a cautionary tale, staying true to the English ballad style. Yet NewTown brings a fresh take with progressive arrangements that harken back to Appalachian roots. The song and accompanying video is the first release from the band’s upcoming album “Old World,” expected later this summer from Mountain Home Music Company. It sets the tone for the rest of the album, highlighting the vocals of both Kati and Jr. Williams and giving listeners a taste of what the band does best — bring tradition into the modern age. Songwriter Donna Hughes says, “It was more than exciting to learn that NewTown would be recording this song! The story of Naomi Wise was a very shocking tale. The legend around her hometown of Randleman, NC, is that she haunts the area still. A young orphan teenage girl with so much hope, lends her trust to a young man of means. The story of deception & betrayal is timeless, and familiar to every generation of souls.” WEBSITE. Background - Indie folk newcomer Ella Grace shares evocative new cut Run, her second release via Ont’ Sofa Records focusing on the pain and heartbreak of a failed relationship and her transition to a better life. Using music to sooth and heal, the 22-year-old Londoner’s therapeutic songwriting is laid bare once more in her latest single, the follow-up to acclaimed debut effort Here We Are Again out late last year. Having developed an impressive online following (over 200,000 Instagram followers), the young female activist touches on aspects of sustainable living, mental well being and feminism whilst sharing a very raw personal journey through her teenage years, aspects of which are firmly rooted in her music. In Run, Ella’s supreme honesty and spiritual observations on 21st century life permeate her dulcet, husky vocals, exemplifying the songwriter’s burgeoning talent ahead of her debut live shows and further releases later this summer. Speaking ahead of the track’s release, Ella stated: “Run was a super cathartic song to write and record, it was a message to someone I loved. I wrote it during a time when I was really split between two worlds. Run was this promise to try and stay with somebody whilst my heart was pulling me in other directions. It was a really bittersweet time for me and I think this track captures it perfectly”. TWITTER. Graceful indie folk, London style, is the first description that sprung to mind when listening to 'Run'. So I go with my first instinct on this, and just throw in a couple of superlatives like imaginative and seductive, for good measure. 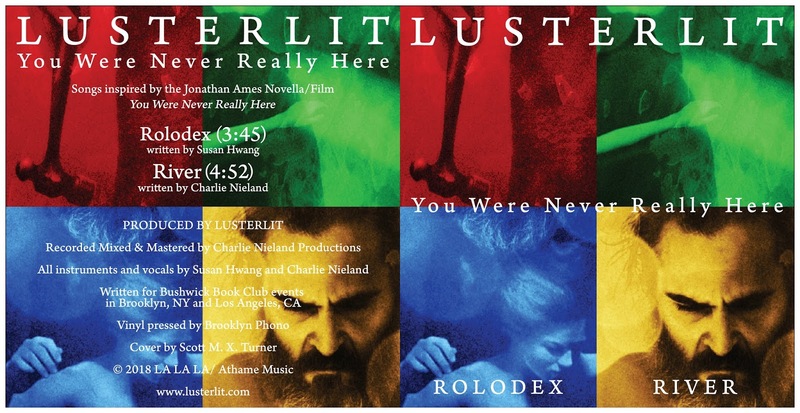 Lusterlit - You Were Never Really Here. The twisted pop of Rolodex and and the relentlessly dark River, available now on Bandcamp, Spotify, Apple Music etc. and on vinyl 45, courtesy of Brooklynphono! Both feature our cinematic blend of electronic and acoustic textures: vintage beatboxes, swirling guitars, Korean drum and sublimely layered vocals, all mining Jonathan Ames' noirish page-turner for more inspired songcraft about books. BANDCAMP. 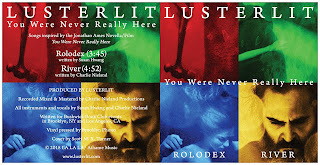 Comprising of two tracks 'River' and 'Rolodex' the latest music from Lusterlit based on 'You Were Never Really Here' continues to impress me in a big way. Their somewhat darker electronic music remains at the very least absorbing, and the occasionally more "out there" moments are a delight.